Move around the office to wherever business takes you - productivity-boosting wireless solutions. Hands-free headsets for desktop phones -- productivity-enhancing solutions! Both corded and wireless Plantronics headset solutions for your desktop phone that are sure to boost productivity! Plantronics headsets that work with your computer - whether for telephone (VoIP) applications or gaming, TSRC has a complete selection! Accessories to complement your headset investment and replacement parts to keep you connected. Communicate more clearly and experience a higher level of listening comfort - amplifiers/audio processors are the interface between your phone and your corded headset. Headset systems with a phone built-in! Both wireless and corded solutions that incorporate a telephone for the ultimate in convenience. This Plantronics Savi 440 convertible, wireless headset is built for UC applications and softphones from Avaya, Cisco, IBM and more. The Savi 440 is ideal for users in campus-like business environments using a laptop for voice calls and requiring the highest sound quality and portability. This Plantronics Savi 440 convertible, wireless headset is optimized for Microsoft Lync and Microsoft Office Communicator 2007. The Savi 440 is ideal for users in campus-like business environments using a laptop for voice calls and requiring the highest sound quality and portability. The Plantronics WTA-610 adapter allows you to use a 2.5mm headset with your Nokia 5100/6100. The Plantronics WTA-NK210 Nokia 2100 series adapter allows you to use a 2.5mm headset with your Nokia phone. The Plantronics WTA-Q6 allows you to use a 2.5mm headset with your Qualcomm 860/1960/2760 series phone. 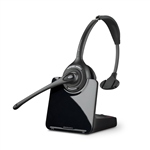 Provides enhanced headset connectivity with 7400 and 8400 series digital telephones/voice terminals equipped with adjunct jack. Works with all Plantronics H series headsets. A Plantronics EHS adapter allows you to remotely answer and end calls from your headset. Connects any Plantronics "H" series corded headset to your AVAYA 302D, 2410, 2420, 4406D+, 4412D+, 4424D+ 4424LD+, 4610SW, 6416D+M, 6424D+M telephone. (Part no. 49323-01, 4932301) The Calisto Pro has been manufacturer discontinued. Instead consider the Plantronics CT14. The CT14 is a wireless phone / headset system for a standard residential phone line (single line). The ultimate in mobility and sound quality for hands-free, secure conversations to your phone. The most flexible headset combines three easily swappable wearing styles in one design. The lightest headset in its class with an all new over-the-ear design. All-day wearing comfort and reliability. Also recommended for VoIP systems. For all-day wearing comfort and reliability in noisy environments. This headset is also recommended for VoIP systems. For all-day wearing comfort and reliability in noisy environments. This headset is also recommended for VoIP systems. The only UC headset you need for everywhere you work. The only UC headset you need for everywhere you work. Includes voice tube, cord clip, 2 ear cushions, background noise suppressor and 3 cleaning towelettes. This is the replacement battery door and side cover for the Plantronics Vista M12 amplifier and Plantronics M22 Amplifier. The Plantronics online indicator lets others know you're on the phone. Six foot cord plugs into base. Online Indicator Light works with all Plantronics Wireless Headset Systems. Genuine Plantronics accessory. Plantronics HW530 & Plantronics HW540 Headset replacement earloops. This package comes with 2 earloops size small (88mm) & large (92mm). 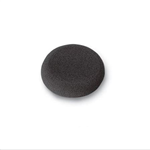 This is the replacement foam ear cushion (qty 1) for use with Plantronics HW530 & Plantronics HW540 Headset. With dual 40 mm speakers that deliver rich, full-range digital sound, Plantronics .Audio 655 offers exceptional performance for your PC audio needs. Connects any Plantronics "H" series corded headset to your Cisco telephone. This cord connects your Polaris headset to your headset-ready telephone. Coiled, 10' long The Plantronics Voyager PRO UC wireless headset can manage both computer and mobile calls and is UC ready. The B230-M is the Microsoft version optimized for Microsoft® Lync™ and Microsoft OCS 2007. The Plantronics Voyager PRO UC wireless headset can manage both computer and mobile calls and is UC ready. The B230 is the standard UC version built for UC applications and softphones from Avaya, Cisco, IBM and more. Plantronics A10 Cord is a special cord (QD - Modular) which allows for an H-series headset to be adapted to headset-ready phones which would normally take a P-series Polaris headset. Optimized for contact centers requiring the highest sound quality. Whether worn over-the-ear or over-the-head, the convertible style DuoSet allow you to make good use of your hands to multi-task. The Mirage earloop-style headset with noise-canceling microphone and Quick Disconnect. The super adjustable TriStar earbud-style headset with voice tube, superior voice tube technology and Quick Disconnect. This headset is also recommended for VoIP systems. HL10 handset lifter fits on your telephone, letting you answer calls with the touch of a button, conveniently and automatically takes your handset off hook. For all-day wearing comfort and reliability. This headset is also recommended for VoIP systems. The Vista M22 Amplifier Base includes Clearline audio to improve call quality in any environment, especially wideband VoIP. The MX10 connects a single headset to a telephone and a PC. The P10 Plug Prong brings hands-free convenience to the PBX and ACD systems and to just about any plug prong type telephone. Replacement battery or backup battery for the Plantronics CS540 headset. Having a battery you can quickly swap out means never being without your headset when that important phone call comes in. This is a package with 2 replacement foam windscreens for the Plantronics Supra noise cancel headsets: Plantronics H51N, Plantronics H61N, Plantronics P51N, Plantronics P61N Converts a "Quick-Disconnect" End to a Modular Plug End. Allows "H" Series Headsets to Operate on M12, T10, T20, S10 and other Plantronics amplifiers. Coiled, 10' long when outstretched. Allows you to use two H-series Plantronics headsets at once for training purposes. The Plantronics 10' extension cord fits any Plantronics headset with a quick-disconnect adapter. Add ten fee to the reach of your headset! Contains voice tube, ear cushion, clothing clip and noise suppressor. Plantroncis CS10/CA10 Replacement Remote Unit For use with the Plantronics CS10 or Plantronics CA10 Wireless Headset. This is the replacement for the remote unit only. It does NOT come with the headset or base Set of 4 earloops (small, medium, large, and new comfort loop), for the CS50, CS50USB and CS60 headsets. Genuine Plantronics accessory. Replacement battery for the CS50, CS50USB, CS55 and CS60 headsets. Genuine Plantronics accessory. Headband assembly for the CS50 headset -- features soft leatherette ear cushion. A great choice if you prefer headband-style headsets to the over-the-ear kind. Genuine Plantronics accessory. Charge your 510/510S/510SL Voyager headset while driving. Simply plugs into your car's lighter outlet. Genuine Plantronics accessory. The Plantronics BUA-100 Bluetooth to USB Computer Adapter gives you the freedom to use any Bluetooth headset with your computer. Plantronics Headset Adapter for Nortel M1250 and M2250 Consoles The Plantronics CS510 wirelss headset is an over-the-head headset with a single speaker. The Plantronics CS520 wireless headset is an over-the-head headset with duo speakers. Plantronics HL10 Handset Lifter for headsets in the CS500 series, Savi Office series, and Savi 700 series (HL10 model 60961-35). The Savi 710 over-the-head, mono-speaker, wireless headset has three-way connectivity (desk, computer and mobile) and is UC ready. 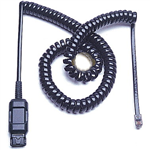 Use this HIS cord to connect any Plantronics H-series headset directly to your Avaya 96xx and 16xx series IP telephone headset port. These are the replacement eartips for Plantronics TriStar headsets, total of 4 ear tips. Triple the number of wireless headsets in the same space without compromise.